So, what gives with all those dinners with me, my Dad, and my Grandfather ending in something less than a sweet goodbye? What were the nature of the barbs being flung wide and far, and why so often? Dad himself was a class act concerning his own folks; he never complained to me about them, at least not directly. A clue to understanding these dynamics has come from my friend, Dr. Giedre Kumpikas, President of the Lithuanian National Foundation and host of the Lithuanian Radio Hour here in New York. She tells me that in the Lithuanian-American community, the eldest son typically occupied a special place of prominence and favoritism. Michael and Patricia Olcott had two boys, Edward and Bernard, in that order. Was Edward openly favored? Unfortunately, I never knew my Uncle Edward and only met him as an infant, far beyond the horizon of my early memories. In examining old family photo albums, I get the idea that he was numero uno in the household. In the photo above of the two boys, I’m not feeling the love so much. Whereas I received favored treatment as the eldest natural born grandchild, I don’t believe that my Dad got the same benefit. Edward himself was an interesting character – and there is evidence of preferential treatment. After graduating from Jamaica High School, he got accepted at Columbia University which he attended for a year. And then due to a curious relationship between Michael Olcott, a Lithuanian immigrant and an NYPD Patrolman on one hand, and the Hon. William F. Brunner, Congressman from the 2nd District of New York on the other, Edward received a first nomination from the Congressman to the US Naval Academy at Annapolis. (In order to apply to the US Naval Academy, you had to be nominated by your Congressman. And the Congressman would nominate four men in order, first, second, third, etc.). In this way, Edward became a member of the US Navy and graduated as a Naval Officer in 1939. I was thoroughly confused by his use of Yiddish expressions as a 7 year old, but came to love them later. About 40 years later, to be exact. (“Born to Kvetch” is a wonderful book on this topic for those readers interested in learning more). As detailed earlier, there were obviously issues between Dad and Michael. Certainly, I was witness to many quarrels – and Dad never wanted to talk about it. But I recall him saying once that his father was given to praising Stalin! When I tell this to my Lithuanian friends, it invokes a gas of horror. Was this the reason why, years later, Michael decided to leave Richmond Hill for the more ethnically diverse South Ozone Park? Well, Michael had a strong personality to be sure. 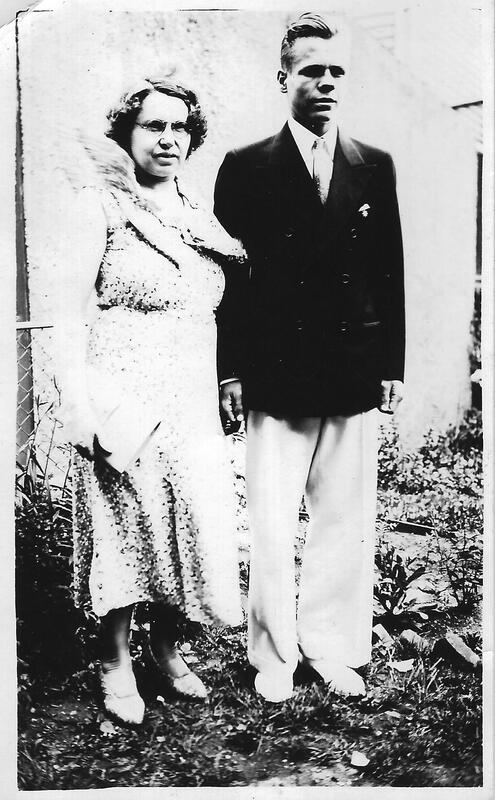 But even more curious is the woman who was his bride, another Lithuanian immigrant named “Patricia Regas,” mother to Edward and Bernard. Unfortunately, I know nothing at all about her other than when she passed in the 1940s, Michael dutifully purchased four lots in Cypress Hill Cemetery – one for her, him, and his two boys. It’s a strikingly beautiful cemetery, designed by Frederick Law Olmstead, who was the architect of Central Park. The cemetery resembles the park in fact, with fairy-tale like promenades, bridges, and lamps. Dad never mentioned his mother. Ever. Not even once. I suspect that it was not a happy relationship. Here is an extremely rare photograph of the two of them together. Must have been a chilly day. I thoroughly enjoy reading about your family history. Your great at it… and I can’t seem to get enough!